RecordMyDesktop is a free and open source desktop screencasting software application written for GNU/Linux. The program is separated into two parts; a command line tool that performs the tasks of capturing and encoding, and an interface that exposes the program functionality graphically. GTK-RecordMyDesktop is one of the available GUIs. GTK-RecordMyDesktop from Maverick now has AppIndicator support. 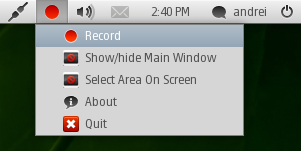 I've backported the Maverick version of both GTK-RecordMyDesktop and Recordmydesktop (its command line backend) to Ubuntu 10.04 Lucid Lynx and you can easily install it from a PPA. I would have done this sooner, but there is a bug (for which I got no answer): the icons for "Show/Hide Main Window" and "Select Area On Screen" are missing from the AppIndicator. Since this is taking too much time to be fixed, I decided to post about this already as it's not such an annoying bug and I'll update the PPA as soon as this bug will be fixed in Maverick. One more thing: the application name under Applications > Sound & Video is now "Desktop recorder".